We teach Pilates as it has been presented to us from all of Joseph Pilates' "elders" (the OG’s of the industry, the first generation of Pilates teachers) and their apprentices. You can expect to learn about your body, work hard, and stay safe with hands-on adjustments, attention to detail, and verbal instruction to deepen your work and build strength. It's not just how hard you can work, but how long you will be able to work that hard. We can help you get the most shelf-life out of your one and only body. We use all Gratz equipment, so that you can experience Pilates just like the man himself intended you to. Our 4 person classes are about as close to a Classical Private as you can get in a group setting. Expect to use a balance of Reformer, Tower and Wunda Chair, with a sprinkling of small auxiliary equipment like the magic circle and the 2x4s. You will be working on 89" Gratz Universal Reformers with Tower (or half Cadillac) conversions. 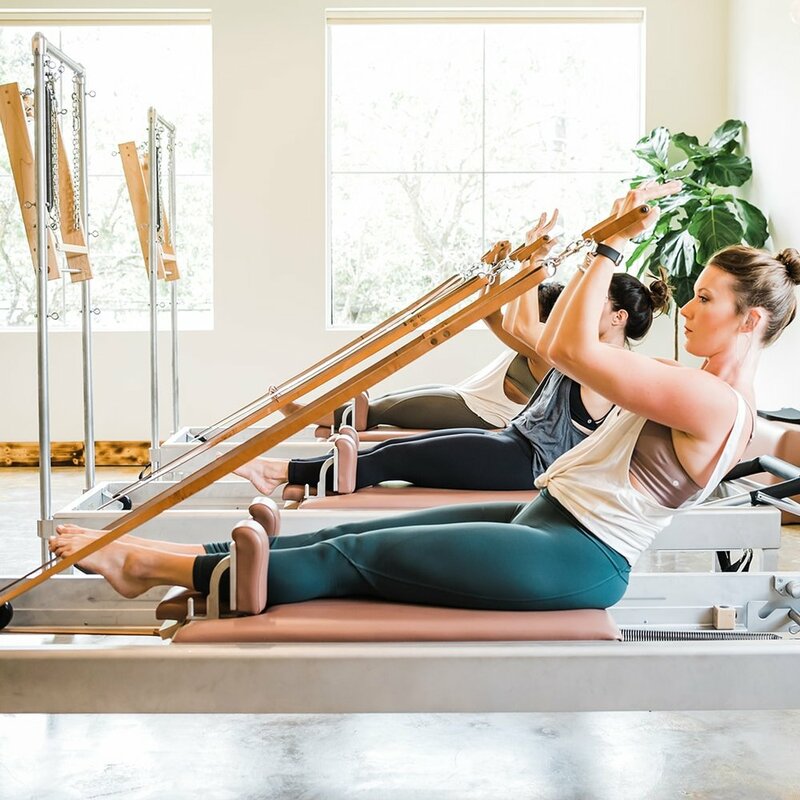 Depending on your and the other 3 practitioners' needs that day a session will be tailored for you, with the instructor selecting from the Original repertoire of Reformer, Cadillac, and Chair exercises. Full Studio Sessions will move quickly; we recommend taking a few Contrology 101 and Contrology classes first if you're new to Classical Pilates. Our goal in these sessions is to provide a challenging and yet safe environment for you to work your body while also understanding how to move it with integrity when you walk out the doors, wherever life may take you. In these Mat Classes we cover the fundamental movements, shapes, and techniques you need in order to move with more strength and integrity in Full Studio Equipment and Core Control sessions. In Contrology you can expect to cover the original Pilates mat exercises as created by Joseph Pilates himself and outlined in his book, Return To Life, with a few modifications if needed. In Contrology 101 we will cover the basic shapes, recurring themes and break down some of the tricker bits, to help you flow faster in all of the other classes, (but that doesn't mean you won't work up a sweat!) Building a strong foundation is key to getting the most out of your workout; this session is a great idea if you are new to Classical Pilates! Core Control classes build upon the original exercises outlined in Joseph Pilates' book, as well as some variations Joe's 1st generation teachers added along the way. We will use a blend of mat, and OG auxiliary equipment including the Spine Corrector, Magic Circle, Hand Weights and the 2x4 platforms. Mom & Babe Core Control takes this same blend of exercises and equipment, and tailors it to the Postpartum body, in a babe friendly environment. of your body. That's what we teach. “You can say what Pilates is in three words. Stretch, with Strength, and Control. Home – What Is This?